← Curious about Matches? We were. As our country celebrates George Washington’s birthday today, we are working on a collection of more than a dozen wine bottles recovered from the basement of the Longfellow House – Washington’s Headquarters National Historic Site. The site is widely recognized as the home of Henry Wadsworth Longfellow, one of the world’s foremost 19th century poets. However, the house also served as headquarters for General George Washington during the Siege of Boston from 1775-1776. The park’s museum collections required more curatorial space, so in 2001 the basement was renovated to accommodate new shelving. The brick floor was removed and NPS archeologists were called in to excavate two unusual deposits. The deposits were composed of historical artifacts and well-preserved biological material all held together by a mortar and sand mixture. Part of the feature extends beneath a wall built ca. 1791. The feature was most likely created to level and stabilize a depressed section of the dirt floor in advance of the construction of the wall. This depression may be evidence of a pre-existing trash pit for kitchen scraps and period rubbish. So if the house was built in 1759 and the feature was BELOW a wall from ca. 1791-then there is a 32 year window to date this archeological deposit. How Many Bottles Are We Talking About? A total of 1546 items were recovered from the two features. Glass wine bottle fragments make up 80% of the artifacts assemblage. Ceramic and glass artifacts can break into many pieces. Each fragment does not necessarily represent a single bottle or plate. Archeologists try to establish a minimum vessel count for an archeological site. The process can be tricky, but there are several clues that can aid this effort. In the case of our wine bottle collection-there are a total of 18 bottle necks. A single bottle does not have more than 1 neck so we were able to determine that we would be reconstructing at least 18 bottles. 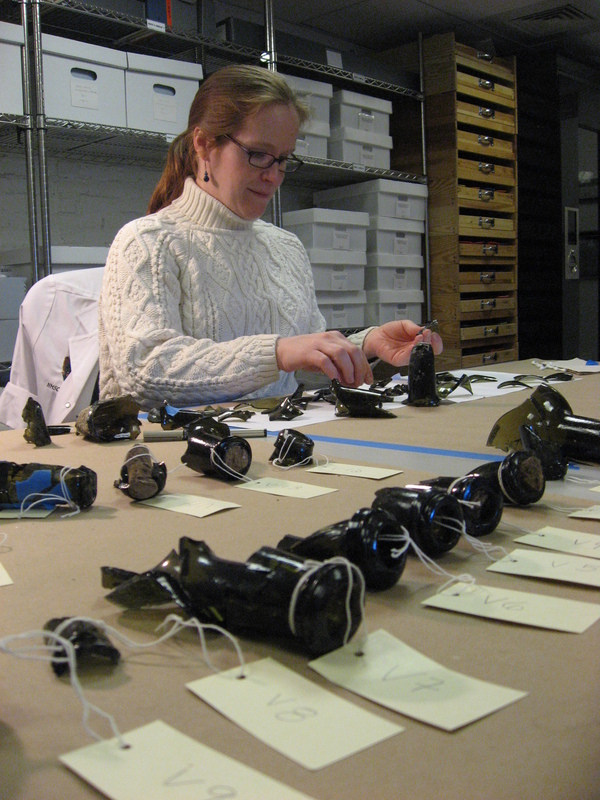 Reconstructing the bottles is helpful because you can determine age based on the style and shape of the bottle. Although we are still piecing together the bottles, the bases and necks are representative of styles from the last quarter of the 18th century. At that time both wine and spirits were stored in dark olive-green glass bottles. 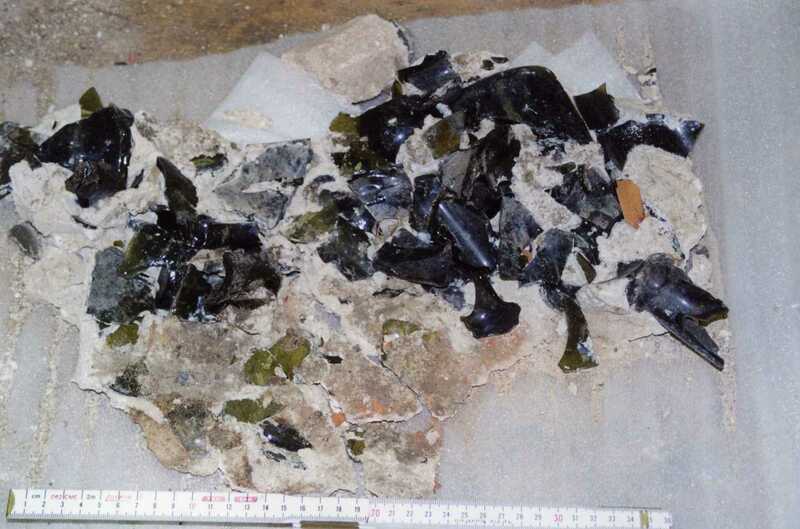 The larger size of the glass fragments as well as intact corks in the necks suggests that the wine bottles were stored in the basement and likely had contents before they were broken. Between 1759 and 1791 the house was home to several families. Both families were interested in botany and horticulture and purchased many plants for the yard. Evidence of fruit bearing trees, rye grass, cactus, and butterfly wings all speak to both the indigenous and exotic plants on the property. The Longfellow house served as headquarters for George Washington and his officers from July 1775 to April 1776. During Washington’s 9 month occupation of the house, his steward, Ebenezer Austin kept meticulous account books of expenses for food, drink and household goods. The account books list orders for mutton, fowl, butter, eggs, fish, smoking pipes, a sugar pot, and an earthen platter. Washington used the ground floor room to the right of the entrance as his dining room and entertained numerous visitors. Seeds of Evidence or Bones of Contention? The well-preserved biological material adds some additional clues. Seeds, eggshell fragments, and oyster shells, and animal bones were well-preserved in the feature. Fish, goat, chicken, rabbit, and rock dove are all represented. Seeds from a muskmelon or cucumber, apple or pear were also recovered from the basement and are listed as being purchased during Washington’s time in the home. Three cherry stones were also recovered and Ebenezer Austin entered payment for cherries in at least two different days in August 1775. One half of an olive pit was also recovered. Austin does not list any purchases for olives, but records from 1772 and again in 1783 document that George Washington ordered olives for his household in Mount Vernon. The plant and animal remains and seeds represent dietary items common to upper class 18th century families. These materials would have degraded quickly so they must have been relatively fresh prior to their incorporation into the mortar mixture. The identified plant remains as well as the presence of sap beetles and the mourning cloak butterfly wing suggests a deposit from mid-to late-summer into fall. However the cherries and the olives could have been preserved year round. So how can we be certain that this trash deposit dates from the mere 9 months that George Washington occupied the house? We simply aren’t sure yet. The detailed accounts by Ebenezer Austin are extremely helpful and remind us that Historical Archaeology is a combination of historic research, architectural analysis, and archeological excavation. Do you know about other historical documents or have ideas on how we can confidently tie the collection to George Washington? We want to hear from you! 1983 Understanding Antique Wine Bottles. Collector’s Club, Woodbridge, Suffolk. 2001 Antique Glass Bottles: Their History and Evolution (1500-1850). Collector’s Club, Woodbridge, Suffolk. This entry was posted in Spotlight On... and tagged Bottles, George Washington, Longfellow, Longfellow House-Washington's Headquarteres National Historic Site, Minimum Vessel Count. Bookmark the permalink. 2 Responses to Did These Bottles Belong to George Washington? Too cool! Here’s hopin’ they’re George’s! !